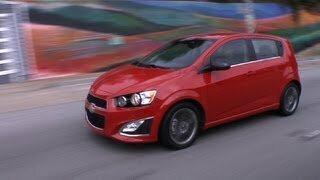 The Sonic RS concept is a performance-oriented model which draws on the legacy of Chevrolet’s high-performance vehicles. The 2013 Chevrolet Sonic RS Concept features engine performance, suspension/brakes and appearance upgrades developed by Chevrolet Performance engineers. Chevrolet Performance 18-inch, split-five-spoke wheels complement the lowered look with aggressive style.